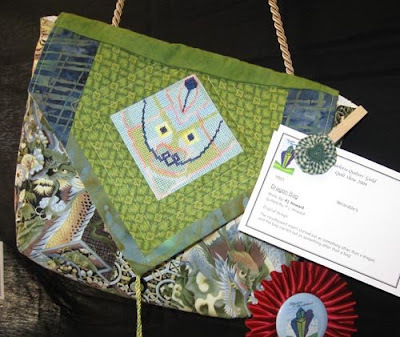 The Charlotte Quilters Guild’s 2009 quilt show opened today! 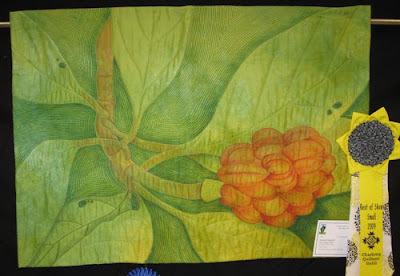 Our own Nancy G. Cook won the Best of Show-Small for “Southern Hospitality,” which features a magnolia tree. This piece also won the blue ribbon in the “Pictoral Professional” category. 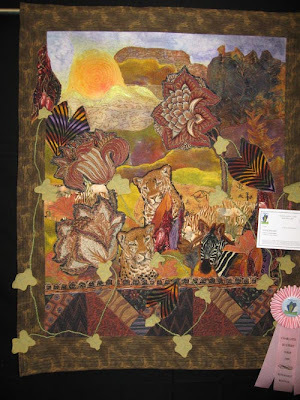 Susan Brubaker Knapp and friends won a second place ribbon in the “Group” category for their quilt, “Motherhood” (above), and a Judge’s Choice ribbon from Joanne Arntsen. 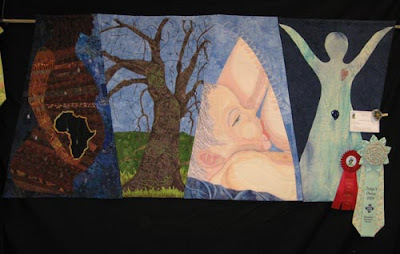 The panels are by (from left:) Grace K. Howes, Lushorn Millsaps, Susan, and DeLane Rosenau. Linda Stegall’s “Losing Serengeti” points out that “the Serengeti plains are one of the world’s largest animial habitats, containing the greatest variety of animals in the world. They … are rapidly diminshing due to our indifference.” She won the honorable mention in the “Pictoral Professional” category. 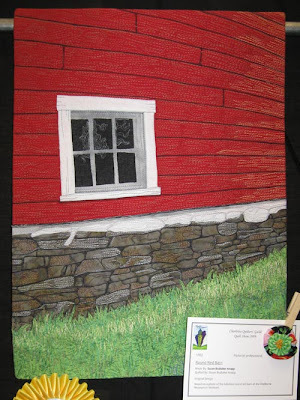 Susan’s “Round Red Barn” won a third place ribbon in the “Pictoral Professional” category. P.J. 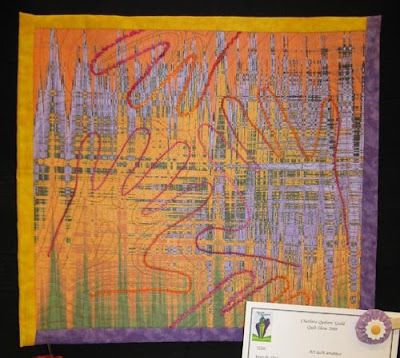 Howard’s “Hands On!” won a second place ribbon in the “Art quilt amateur” category. 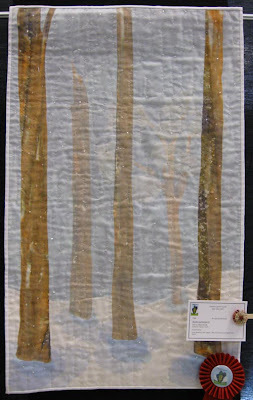 Nancy G. Cook’s “Winter Confection III” won a second place ribbon in the “Art quilt professional” category. P.J. 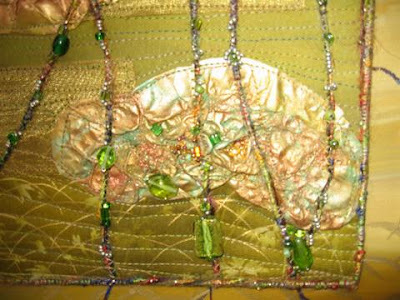 Howard’s “Dragon Bag” won second place in the “Wearables” category. 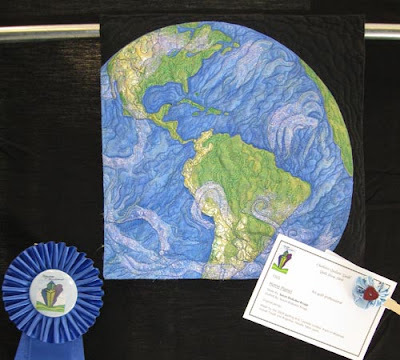 Susan’s “Home Planet” won first place in the “Art quilt professional” category. 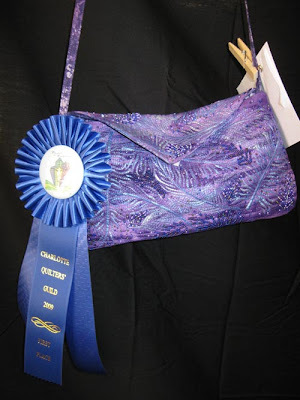 Susan’s “Purple Evening Bag” won first place in the “Wearables” category. 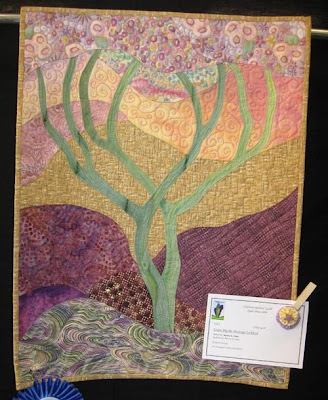 Nancy’s “Crepe Myrtle: Homage to Klimt” won a blue ribbon in the “Innovative” category. 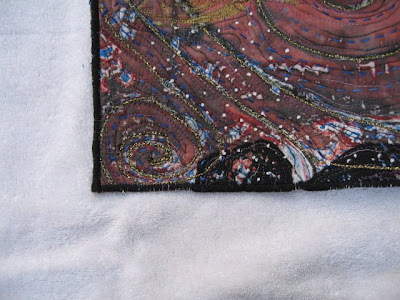 Since Janet’s screen printing class, I have spent most of my time on screen printing my own fabric for smaller fiber art pieces to be framed or attached to canvas as per photos. 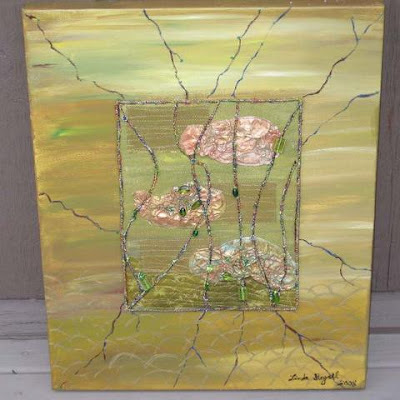 “Verde” (above) is attached to canvas painted in coordinated design. 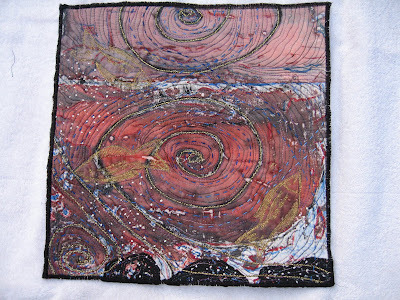 “Metamorphosis at Sea” (below) was made from fabric screen printed at Janet’s class and finished with machine quilting and hand stitching in royal blue for accent. 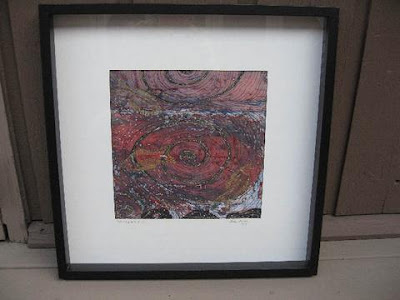 I managed to finish and frame by the March 6th deadline and entered it in the current Mint Hill Arts Metamorphosis exhibition. My other current endeavor is trying to equip a guest bedroom and bathroom for screen printing (not a really good idea, there is only one large dye stain on the carpet so far). 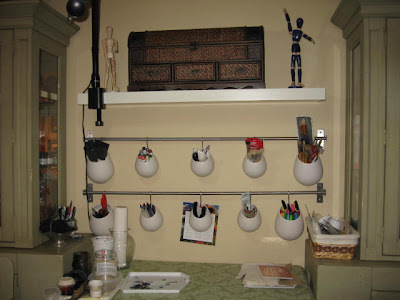 Ikea’s kitchen storage items are great for studio use. 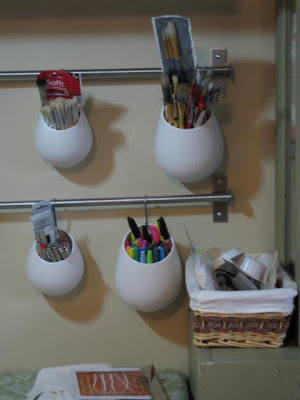 Pencils, brushes and tools are all visible and within easy reach; thus eliminating the 15 minutes I usually spend going through drawers and baskets looking for each item I need.